The development of the rosary has a long history. First, a practice developed of praying 150 Our Fathers in imitation of the 150 Psalms. Then there was a parallel practice of praying 150 Hail Marys. Soon a mystery of Jesus’ life was attached to each Hail Mary. Though Mary’s giving the rosary to St. Dominic is recognized as a legend, the development of this prayer form owes much to the followers of St. Dominic. One of them, Alan de la Roche, was known as “the apostle of the rosary.” He founded the first Confraternity of the Rosary in the 15th century. In the 16th century the rosary was developed to its present form—with the 15 mysteries (joyful, sorrowful and glorious). In 2002, Pope John Paul II added five Mysteries of Light to this devotion. Click here for instruction on how to pray the Rosary. RosaryPlusRD ($1.99) iOS This is probably the prettiest rosary app on the market. It is also very easy to use–tap the shiny bead and it disappears. Simple. Its visual beauty is extended into the lovely reflections in text if you want that element added to your prayer experience. The effort the developers at St. Clement ePress put into their products is first-rate. Their Catholic apps by far exceed quality, beauty and ease of use of most similar apps in their categories. This rosary is no exception and makes one wish all apps were developed with this careful attention to dignity and beauty our devotions and the souls engaged in them deserve. TabView allows you to open an assortment of exquisit images for your meditation while you pray. In addition to the rosary, you get Dominican Scriptural Rosary, Devotion to Seven Sorrows of Mary and chaplet to St Michael devotion included in the package. Here’s another helpful review. Touch Rosary (Free) Android As its name implies, this digital rosary displays a full set of beads that glide as you move your finger from one bead to another–an attempt at simulating using real rosary beads. This rosary is impressive for the price given all its many features. Prayers for each bead are displayed to the side. Mysteries can be chosen automatically based on the day. Each mystery has an image and corresponding bible verse to help your meditation on the mysteries. Bead highlight to track your progress. Fifteen Promises of our Lady and how to pray Miraculous 54 Days Rosary Novena. Virtual Rosary (Free) Android– as the name says, it’s a virtual rosary in the sense that you tap the screen to move the digital count. This is not a graphic rosary bead version. To help you meditate and keep count while your eyes are closed, it will vibrate after every decade. It is clunky and inelegant in design, but it works. Decade Rosary (Free) Android – Audio and visual rosary for single decade that you can repeat to complete an entire rosary if you choose. But if you only have time for a decade or two, this is ideal. Rosary Pro (Free) iOS Available in Spanish, English, Italian, French, Catalan, Rosary Pro allows you to pray the rosary in different ways–reading, scrolling through beads or listening. Looking for a rosary that will chime or vibrate in your hand as you advance through the prayers? This one has a rich tactile/audio option so you can pray without looking at your screen. It vibrates when your iPhone is set to silent mode (so you can use it in church or while it is in your pocket). The Our Father beads vibrate and chime differently, so you can tell where you are without peeking at the screen. To make it really custom, this app offers you the ability to record the prayers yourself for playback during the automatic audio rosary. Some of the languages offered come with pre-recorded audio. English does not. So, you can make up your own (or use your children or others to record themselves praying). Its scrolling through beads option is a little odd. Don’t look for virtual beads that advance in some way. This is a text-based visual presentation that counts your swipes on the screen as you advance through the rosary. It is not meant to be a virtual rosary bead experience as other apps offer. Enjoy an assortment of configuration options to choose from including setting a reminder alert to pray at a particular time and the option to include various prayers and other traditional elements people add to their Rosary. Also, you can send a tweet or post to your Facebook account a message when you are going to pray the Rosary. Holy Rosary Deluxe ($1.99)–iOS – This has a pleasing, somewhat realistic interface with 5 different modes of counting including your choice of bead versions. Intuitive slide of your finger over the bead image to keep track of your prayers. Divine Mercy Chaplet included. You can switch to right or left-handed bead counting for your thumb. Full text of all prayers included. Audio option for clicking sound and background music. Interface makes it easy to pray with your eyes closed because of the sound and vibration options available for each bead or just the decades. You can customize this by changing the photos for each mystery using photos in your collection. Resumes where you left off when you return. Adjust the font size. English, Spanish, Italian, French and Latin. There is a “Lite” version of this available for $.99. Lacks some customizable features. Includes option to turn off Luminous Mystery. 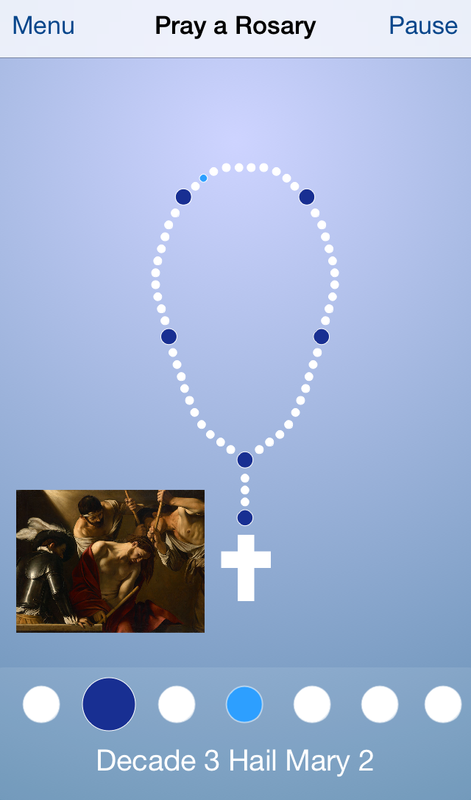 My Rosary ($.99) Nook From Developer: Pray the Holy Rosary from your tablet. This app will help guide you in praying the Rosary or Chaplet of Divine Mercy. Set to the background of Gregorian music, beautiful pictures and bible verses for each Mystery will help you meditate and reflect. All the prayers and scripture verses for each Mystery are shown (including the Luminous). Easy to use and no prior knowledge of the Rosary is needed, perfect for Catechism students and families wanting to learn the prayers. Catholic bible verses are used for each Mystery. This app will remember where you left off when life interuptions occur, perfect for busy families. Supports both English and Spanish. vibration feedback at the beginning of each of the five Mysteries (iPhone only), to help you keep track of the Mystery you are praying. Here’s a video demonstration you can check out. Rosary of the Hours (.99 cents) iOS only. I love the concept! Description from developer: St. Paul exhorted the young Church to pray always. Over the course of centuries, the Church introduced the Rosary, a simple yet profound prayer for praising God and meditating on the holy mysteries of Christ and His Blessed Mother. Now there is a way to pray the Rosary “around the clock,” whereby a decade, with its own special theme, may be prayed for each of the twenty-four hours of the day. The Rosary of the Hours includes the full, original text of the Rosary of the Hours, as well as a convenient reminder system that can be customized to fit your schedule. You can even post to Facebook and Twitter regarding your prayers, intentions and devotions, allowing you to pray both for and with the universal Church in a new way. Record A Rosary ($1.99) iOS and Android Record your loved ones saying the prayers of the Rosary. Play the recordings as you pray along uniting your voice with theirs. Think play and pray. Does mom or dad have an iPhone or iPad? Want to encourage them to pray the Rosary? Or is mom a Rosary-praying Red Sox fan already, and you want to add some touching elements to her experience with this devotion? Here it is! Let’s run through the features to give you a feel for this nifty app. Record your loved one once for each prayer. You may record many loved ones. Play one voice or play many voices at once. A set of graphic Rosary beads on the screen go along with the virtual reality of the Rosary in your hand. (Okay, so it’s not the most high-tech Rosary you’ve ever seen on a Rosary app, but it works). Soft music plays in the background (if you choose that option). Mysteries are announced and beautiful pictures appear along with a Scripture passage for your reflection. Naturally, the app opens to the mystery of the day, but you can choose another if you wish. And take this wherever your mobile device follows because no internet connection is required to run this app. Let’s take this out of context of a gift. How about a teaching tool for children using your voice, their voice or other voices of people they know and love? Record Grandma and Grandpa so your little one can pray with them when they are apart. Give that child something touching to listen to as he or she falls into prayer using this app. (You cannot skip through the recordings. You have to listen all the way through the prayer before the little bead will change color. Think about the importance of that to the user). St. Therese fell asleep in prayer, so let your child –or YOU, for that matter–fall asleep listening and praying with the voice of someone dear. Mary App (Free) iOS . The Marian Fathers of the Immaculate Conception who brought you the Divine Mercy app have produced a full-resource Marian app. Our Blessed Mother is a big topic, so developers broke the subject of Our Lady into three categories: Doctrine (Church/Scriptural teachings about her and reasons for our devotion with FAQs); Devotion (rosary, chaplets, prayers, feasts, consecration to Mary, sacramentals) and Mary Plus (pilgrimage sites, images, info on apparitions, info on the Marian Fathers). As one reviewer put it, this app is comprised of three great apps rolled into one. The rosary in this app is terrific if all you want is a nice virtual bead experience with vibrations (iPhone only) at each bead so you can have tactile cues when advancing through your prayers. The vibration does not change with the Our Father beads, so you still need to peek every now and then. There is an audio option with this rosary. Holy Rosary–Spanish Edition (Free) Android You’ll like the fact that when you launch the app, the appropriate mystery automatically loads for the particular day. You also have the option to manually choose which mysteries you would like to pray along with. A Spanish audio version of the Rosary is also available within this app for hands-free use. Relevant Radio (Free) iOS Android, Kindle Fire (1st generation and up)- Various audio rosaries are imbedded in this app so that you can listen and pray hands-free with a rosary lead by a Catholic priest. Get your rosary with our without music; 17 minutes or 28 minutes (with reflections added). Relevant Radio provides calm, clear and charitable discussion of matters of our Catholic faith broadcast on dozens of stations across the United States. Producers characterize the station as “Talk Radio for Catholic life. ” With this app, you can access their broadcasts on live stream. Plus…broadcast shows are available on demand via podcast which they archive for the period of one month. As an additional feature, Relevant Radio serves up audio recordings of various prayers which add considerable value to the app on your mobile device: Rosary (all mysteries with or without music); Chaplet of Divine Mercy; the Memorare; Angelus and Regina Coeli; Prayers to St. Joseph. A separate tab allows you to send in your prayer requests which producers say are prayed for individually in front of the Blessed Sacrament. Daily Mass readings are also available in text format only. Rosary on Skype A new virtual group all over the world is praying the Rosary on Skype. Read about it here. Organiser Mrs Kinga Sólyomné Székely, writes: “Every evening at a set time, usually 21.00 UK time, we connect together in groups of 8 -10 people on Skype, via a live conference call, to recite a Rosary (with five Mysteries). Before and after this we might pray other prayers too. According to the report: For further information or to join one of the ‘Virgin Mary’s Smile’ prayer groups, please contact Mrs Kinga Sólyomné Székely on: theholyrosaryprayer@gmail.com, or on 00447413750031. Finally…to avoid disappointment, we encourage you to visit the links provided to read up on the details of the apps you are interested in. We include apps in this site because they contain certain functions or elements worthy of consideration. But the individual apps may not exactly fit your needs. The more information you look up, the less likely you will be disappointed in your purchase.